Eaton sophomore Lexi Miller will be counted on this season to help the Eagles improve on their 7-16 record from last year. EATON — Dave Honhart knows his team will be tested this season, but with four returning starters and seven of his top nine players returning, he believes his team will be up to the challenge. 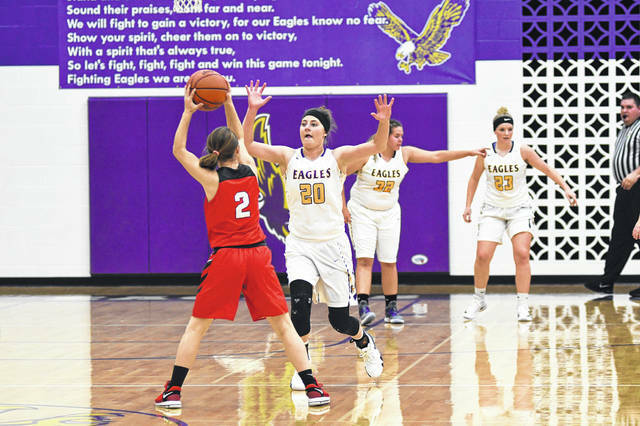 The Eagles will be looking to replace the leadership of Bailee Worley and Kurstin Frost, who both graduated. Eaton, 6-17 last year, return starters Bailey Shepherd (junior) and seniors Becca Mowen, Emily Dungan and Annika Gels. Also back are junior Ashley Earley and sophomores Lexi Miller and Kylee Pitsinger. In addition, senior Anna Black returns after sitting out last season. Freshman Allison Mowen is the lone addition to the team. Junior Rilee Worley, sophomores Kylee Kidwell and Trinity Eddy and freshmen Juli Couch and Mara Posey will see time on both the junior varsity and varsity. Shepherd, a 6-foot forward, was a first-team all-league performer last year and led team in scoring (10.6 ppg) and rebounding (7.1). Becca Mowen, a 5-10 forward, returns for her fourth season and third as a starter. The three-year captain led the team in shooting percentage and was second on the team in rebounds (4.9) last year, while averaging 6.0 points per game. Dungan, a 5-5 guard, returns for her fourth season and third as a starter. She was the team’s second leading scorer (8.5) and rebounder (4.9) last season. Gels, a 5-7 guard/forward, is back for her third season and was recently selected as a team captain. She was one of the team’s top 3-point shooters a year ago. Earley, a 5-9 post player, is a solid role player who does all the little things right that don’t always show up in the box score, according to Honhart. “We almost always play well with her on the court,” the coach said. Miller, a 5-9 guard/forward, and Pitsinger, a 5-6 guard, grew into contributing roles last year, according to Honhart. “I expect they will continue to develop their roles,” Honhart said. Black, a 5-6 shooting guard, returns to the team and Honhart expects her to provide a spark as a playmaker. Allison Mowen, a 5-5 guard, has been impressive in the preseason and should see significant time at the point guard spot, according to Honhart. Coach Doug Mize joins the staff as an assistant and brings passion and a strong knowledge of the game, according to Honhart. Maggie Neanen returns has head junior varsity coach/varsity assistant. Honhart, in his fifth season at Eaton (46-48), expects the league to be as good as ever. Last year two teams reached the regional, with Bellbrook advancing the state’s final four. Eaton will begin the season on Friday, Nov. 23 at the Annie Oakley Shootout, hosted by Greenville. The Eagles will play Bradford at 6 p.m.
Eaton will play either Greenville or Ponitz on Saturday at 6 p.m. or 7:30 p.m. The junior varsity will open with Versailles at 3 p.m. on Friday and will play at 3 p.m. or 4:30 p.m. Saturday. 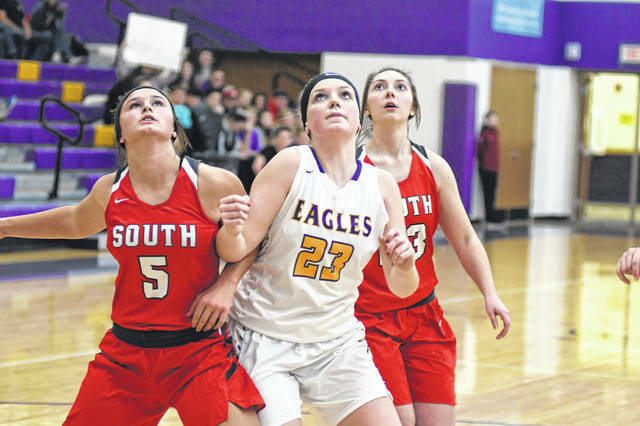 The Eagles will begin SWBL play on Thursday, Nov 29, with defending champion Valley View, at home, and are scheduled to travel to Middletown Madison on Monday, Dec. 3. Junior varsity games will begin at 6 p.m. on weeknights and at noon for Saturday games. 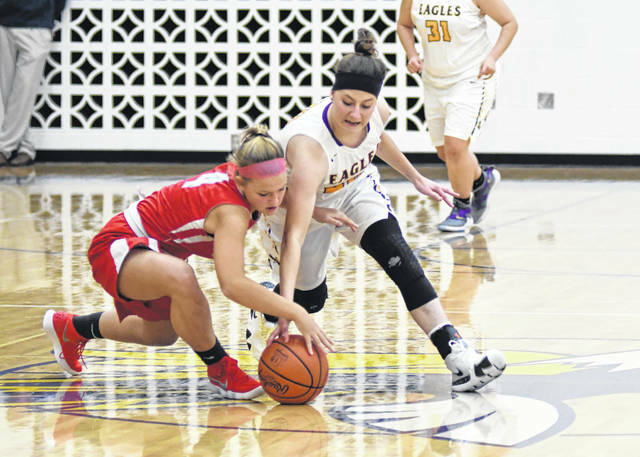 https://www.registerherald.com/wp-content/uploads/sites/41/2018/11/web1_ehsgbk2-2.jpgEaton sophomore Lexi Miller will be counted on this season to help the Eagles improve on their 7-16 record from last year.